Each day over 4,000 elderly people are in hospital despite being fit to leave, an NHS watchdog has said. A report by the National Audit Office found that in a third of cases, discharge was delayed for more than a month. But the report, which looked at NHS hospitals in England, said the situation was improving. In September 2002, there were 4,100 over 75s - 9% of the total hospital population - awaiting discharge, down from 5,700 - 12% - a year earlier. The NAO said the Department of Health and other health and social care organisations were making "good progress" in tacking the problems of bed blocking. But it warned more needed to be done to ensure the government's target of ending "widespread delays" was met by 2004. 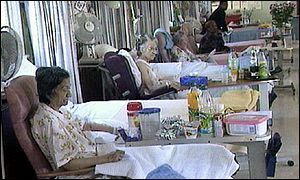 The shortage of nursing and residential home places is the biggest obstacle to eradicating the problem, the NAO said. But it added delays in finding places for those needing intermediate care or in completing alterations to patients' homes also meant people stayed in hospital for longer than necessary. The NAO called on hospitals to start planning for discharge as early as possible. It said the biggest cause of delay was a shortage of trained therapists, which meant "needs assessments" could not be carried out. It also warned that how delayed discharges are defined needed to be improved. The NAO said some hospitals have a "breathing space" of up to seven days before they begin measuring the delay. Poor co-operation between health and social services organisations was also a problem, they said. Sir John Bourn, head of the NAO, said: "Many tens of thousands of older people each year find themselves unable to leave hospital, even though their treatment has been completed. "This significantly reduces their quality of life and undermines the ability of hospitals to treat more patients and meet testing targets." Edward Leigh, chairman of the Commons Public Accounts Committee, said: "It is intolerable that on any given day 4,000 older people who have finished their treatment are left trapped in hospitals simply because the public services cannot get their act together." A spokesman for the Department of Health accepted more needed to be done to tackle delayed discharge. But he added: "The report highlights that good progress has been made over the last eighteen months, particularly in services that provide a bridge between hospital and home." He said thousands of extra intermediate care beds and non-residential places had been provided, and many more people were receiving intensive home care to help people live at home. David Behan, president of the Association of Directors of Social Services, told BBC News Online: "I see this as a mid-term report. It's saying 'well done', carry on, more of the same is needed." But the Independent Healthcare Association criticised local authorities, whose "scandalous misuse" of government funding it said had caused the current problems. The NHS Confederation, which represents hospital managers, said it was working with local government and social services departments to co-ordinate care for the elderly. Charities for the elderly said the NAO's report showed how older people were suffering, and were not being consulted about plans for their hospital discharge. Gordon Lishman, director-general of Age Concern England, said: "Many older people continue to be stuck in hospital when they are well enough to leave because care is simply not available to them: either to help them in their own homes, or places in care homes. Jenny Stiles, deputy head of policy at Help the Aged added: "The government's proposal of fining local authorities is, at best, a one dimensional approach and at worst risks undermining the collaborative efforts between health and social services professionals which have led to a significant reduction in delayed discharges over the last year." Paul Burstow MP, Liberal Democrat spokesman on older people, said: "Until the Department of Health listens to those who work within the health and social care system, more older people will be treated like unwanted packages in a macabre game of pass the parcel." Shadow Health Secretary Dr Liam Fox MP said it was "scandalous" that more than 4100 patients over 75 are waiting to go home at any one time. "This is the equivalent to seven district general hospitals simply closing their doors to all patients." "Many nursing home owners blame new regulations"